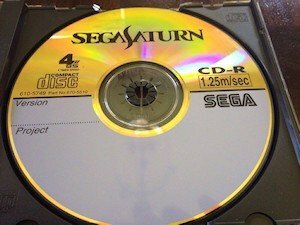 A new Sega Saturn prototype surfaced some days ago and then was dumped! It is for the game Armed, also known as Aftermath. 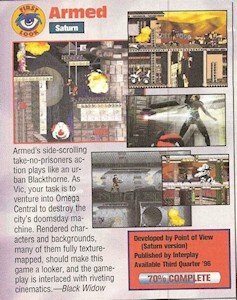 Here is how this prototype was found (taken from a post by A Murder of Crows on Assemblergames.com): Several years ago, Don Russell answered a Craigslist ad for a Sega Saturn and around 50-100 games. In that ad was a lot of Sega saturn prototype discs, including several unreleased games. One of those games was Armed, also known as Aftermath. Over the years, several of the discs have been damaged, some probably forever. Don asked me to properly dump these discs before they were lost forever. Don traded Armed and Bedlam to Drew Kerns of Oregon in exchange for Delisoba Deluxe and Eyeful Home. Don had Drew hold on to the proto discs for A Murder of Crows to dump. He finally was able to start doing that dump at Drew's house with a help from F1ReB4LL from the Redump.org forums. Don has allowed A Murder of Crows to release Armed to the public. A podcast has been made about it and the prototype was released at the same time. Enjoy this new Sega Saturn game. More prototypes could be dumped soon, stay tuned.